Wednesday November 14, 2018: Sharon takes Billy up on an offer, Lola gets a big opportunity, and Victoria's warned not to leave town. At Rey’s apartment, Mia has breakfast ready, and lets Rey know she had a run-in with Sharon last night. Rey dresses for work, and Mia plants a deep, lingering kiss on him that he pulls away from before leaving. At home, Sharon tries unsuccessfully to get Mariah to talk. Kyle arrives, so Sharon leaves them. They joke about Mariah moving out of Tessa’s place in record time before Mariah explains Tessa can’t be honest with her. Kyle references his relationship with Lola and advises Mariah to let Tessa know her expectations. At the station, Michael advises Victoria to just answer the questions simply, and if necessary, defer to him. Sharon arrives as Michael complains about Rey being late. Rey appears, and Sharon looks concerned. In the interrogation room, Rey questions Victoria about knowing he’d found the watch in Chancellor Park – he never told Mac that. Victoria explains Abby got the information from Arturo. Rey asks how she knew the police never found JT’s body. Victoria replies, “I didn’t. How could I?” Rey badgers her about asking him about DNA until Michael intervenes. 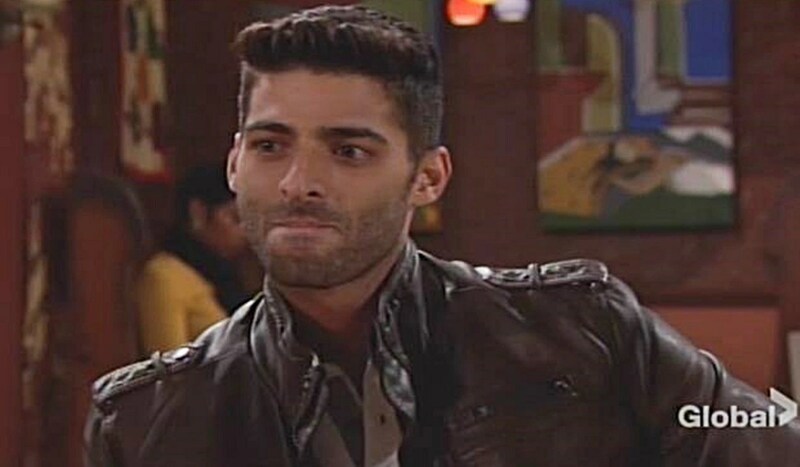 After Rey exits, Michael urges Vikki to come clean if she’s done anything wrong. She swears she hasn’t. At Jabot, Kyle can’t understand why Billy’s so morose; this is his night. Billy gripes about the glory for Jaboutiques going to Phyllis. Kyle assures she’s a flash in the pan. After, Billy relays that Phyllis’ caterer backed out. Kyle tells Billy he’s got this. He later returns with Lola and advises her she’s catering the big event – tomorrow she’ll be the talk of the town. Lola declares, “I can do this!” He gives her the name of their temp agency for servers and a gourmet grocer. Lola was looking forward to their date. Kyle says they’ve forever to go on dates; tonight her dreams come true. At Devon’s place, Mariah opens up about Tessa’s tenuous relationship with the truth. She thinks she’s a good person underneath that. Devon senses she came to him because Hilary was also a complicated person. Mariah asks how you know when to forgive, and when to pack up and go. Devon thinks the best thing would be for Mariah to give Tessa some space, then fill the void with love and understanding. He regrets the time he wasted expecting Hilary to be perfect, and urges Mariah to love Tessa for who she is. In Crimson Lights, Abby makes Mia’s acquaintance. Mia gloats about having made up the CEO of Jabot yesterday, then recognizes Abby as ‘The Naked Heiress’ and asks for a selfie. When Mia walks off, Arturo arrives. Mia returns and joins him and Abby, who learns she’s Rey’s wife. As Abby hugs Mia, Arturo shoots his sister-in-law a warning look. They sit down to chat and Mia exchanges contact information with Abby. Arturo reminds Mia if Rey’s case wraps up, she’ll be leaving soon. When Abby remarks the case has turned into a murder investigation, Mia beams at Arturo and says she’ll be around for a long time. 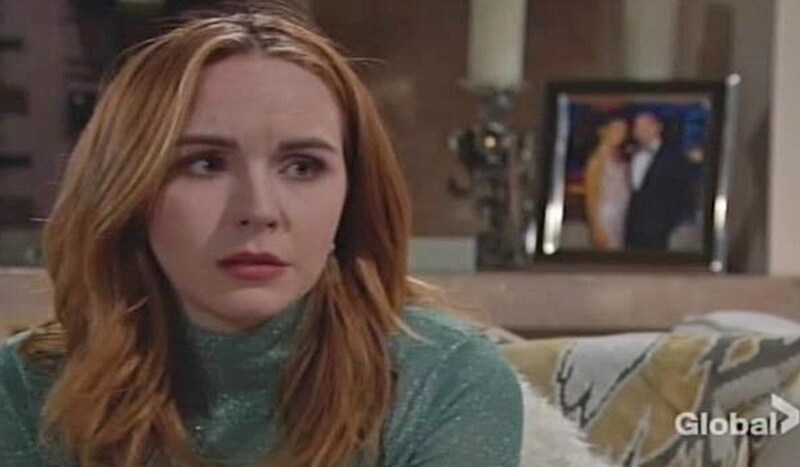 Talk turns to Miami, and then Abby invites Mia to bring Rey to the Jaboutiques launch. Arturo looks increasingly uncomfortable. On the patio, Victoria relays to Sharon that Rey told her not to leave town. After, Arturo corners Mia and tells her to stop her games. She needles that it sounds like he doesn’t want her there. Arturo informs her they’ve all moved on…without her. Inside, Billy informs Sharon he’s not attending the launch – he can’t watch Phyllis take credit for everything he did. Sharon thinks he’ll regret not going. Billy reveals Nick and Phyllis are going together…the only way he’s going is with Sharon, and he won’t put her in that disaster. They agree to hang out later, and Billy runs into Mia as he exits. When Mia snarks that Sharon looks exhausted, Sharon calls to Billy that they’re going to that party. In Rey’s apartment, Lola’s cooking away when Mia enters. The women spar verbally as Lola tells Mia her brothers don’t want her there. Mia’s unfazed. Rey arrives at Crimson Lights and Sharon informs him Victoria isn’t capable of murder. He asks, “Even in self-defense?” Mia interrupts and drags Rey upstairs. At Tessa’s place, Mariah needs the truth. Tessa admits someone did something they regret, and paid her to stay quiet. Mariah next learns that she pretended to be in love with Noah, and asks, “What about me?” Tessa admits falling for her was never part of the plan; she never knew she could be happy living in a shoebox while in love. Mariah recaps she’s keeping a secret for money. Tessa confesses that Nikki Newman is the one who gave her the money. Mariah wants to know the secret. Tessa insists, “You don’t want to know.” Mariah next learns Nikki doesn’t know she paid Tessa – it was blackmail. Mariah worries. “What else aren’t you telling me?” Tessa alludes to Sharon being involved. Mariah threatens to go to Nikki or Sharon. Tessa shouts that they’ll hate her. Mariah intones, “Tell me.” Tessa pulls out a laptop to show her the truth.